Oh My. 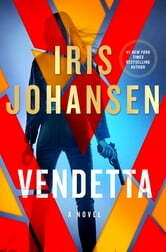 It’s been a while since I’ve read an Iris Johansen book and I was beyond thrilled when I saw Vendetta was available. I picked up the book with high expectations of being pulled into the story and reconnecting with characters. I was not disappointed. Iris Johansen pulled me in, took hold of me, and never let go until the very end of the book. The best part is that she left me excited for more of Catherine Ling without leaving me with a cliffhanger. While Vendetta is part of a series it is a stand-alone book. I was a little confused why the cover states that it is part of the Eve Duncan series where really this is part of the Catherine Ling story, with a very very small mention of Eve Duncan. Yet, the mention of Eve Duncan may have been what made me excited to pick up the book, the storyline is what kept me reading. Rachel Venable is a character that I loved getting to know. I loved learning about her history, her wit, and her smarts. She finds out her father has been killed and that she is now being wanted by the man who killed him. There is so much more to that story but I am not going to give away any spoilers. It was amazing how her friends and her father’s friends came to her defense and protected her. I loved how they became a family that she needed and didn’t hesitate to help her when needed and keep her safe when she wasn’t looking to do so herself. Iris Johansen is a must-read author for me. The Catherine Ling series is one that I enjoy and am excited to continue reading. I recommend picking up your own copies ASAP. 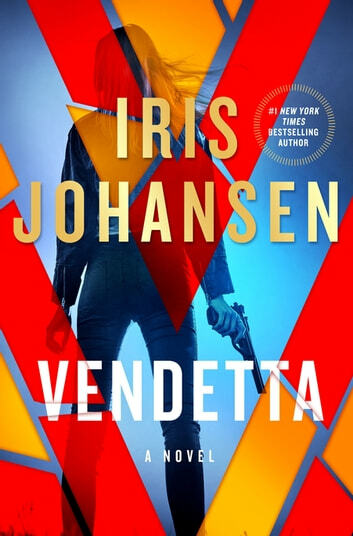 4 Stars Review by Morgen Late Night Reviewer Up All Night w/ Books Blog Vendetta by New York Times best selling author, Iris Johansen is a standalone and a stunningly captivating thriller. It is a swiftly moving adventure that doesn’t pull punches. The story is about revenge, racing against the clock and the ever evolving truth that comes with a life full of secrets. Rachel Venable is a doctor with One World Medical. Her team brings medical aid to those in poor and war-torn countries often risking life and limb to do so. She is truly compassionate and caring and puts the needs of others above her own. She has been taught in the art of herbs and can brew potions to either heal or poison. She is brilliant, determined and stubborn. With the last few breaths he had before dying, Carl Venable, the head of the CIA task force on terrorism, gives Brandon a mission. His main objectives are to keep Rachel safe and utilize her vast skills and knowledge to assist in the take-down of the terrorist known as Huber. Huber’s violence and reach knows no bounds. Regretfully, Rachel is currently in his crosshairs. He believes he can use her to his advantage. Brandon must get his squad together to find her first and assist in his obsessive quest for revenge. This starts an adventure of epic proportions as they try to stay alive by being a few steps ahead of Huber. It’s not as easy as it seems. The book is written in third person which gives the reader a more extensive view of the scenes. The author smoothly switches from scene to scene and from character to character. My favorite part was that this is not a two person team. The squad is made up of fun and exciting characters I couldn’t wait to learn more about. The characters have a foundation that is built on naturally. The banter was fun to watch. The story is faced-paced, and takes the reader on a ride they’ll never want to end. The attention to detail is amazing. Rachel’s character has a lot of depth that I connected with. I couldn’t help but be intrigued and root for her. I loved her willpower and her inability to let anything keep her down. It was a roller coaster full of emotions and intrigue. The more you learned the more you needed to know. I’d definitely recommend this book to anyone who enjoys a good crime thriller. Vendetta, an intriguing book from start to finish. An excellent read as always from Iris Johansen. I thoroughly enjoy books that she brings back characters from other books she has written, especially from the Eve Duncan series. Definitely a must read. Kept you guessing til the end. This was a great book! I really enjoyed it. I really enjoy hey style of writing and In an really likely the stories with Rachel and Catherine in them.